I read this book after reading and then reviewing Dan Cohen’s Negotiating the Nonnegotiable: How to Resolve Your Most Emotionally Charged Conflicts and highly recommend both. Yes, Cohen and Deepak Malhorta do cover same of the same ground and agree on several of the same strategies and tactics. However, those who are involved in — or now preparing for — negotiations that are “nonnegotiable” and “impossible” really need all the information, insights, and counsel they can obtain. There are dozens of real-world situations examined in this book that Malhorta cites from a wide and deep background of teaching and working with thousands of business executives and company owners. He suggests those principles, insights, and lessons that he thinks will be of greatest interest and — more to the point — of greatest value to those who are struggle to negotiate the impossible, whatever the n nature and extent the given issues may be. 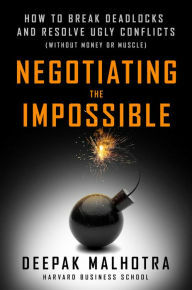 To repeat, I think very highly of both Negotiating the Nonnegotiable and Negotiating the Impossible. Amazon US sells copies of both for a total cost of $35.62. That seems to be a prudent investment whether you are negotiating for career advancement or involved with an M&A team.